Tammy, a volunteer at the annual Simon’s Cycles YANA Ride. People volunteer time for various reasons, be it helping others or doing something fun in their spare time. There is also an economic side to volunteerism. British Columbians, for instance, contribute an estimated 114 million volunteer hours each year. Locally, there are numerous volunteer opportunities with organizations such as the Cumberland Community Schools Society, the Therapeutic Riding Society, Relay for Life, Scouts Canada, Girl Guides and the Community Justice Centre Society. These are all listed on the VCV website. Vancouver Island MusicFest would not happen without its estimated 1,300 volunteers who tend to the gates, stages, food and other aspects of the annual gathering. 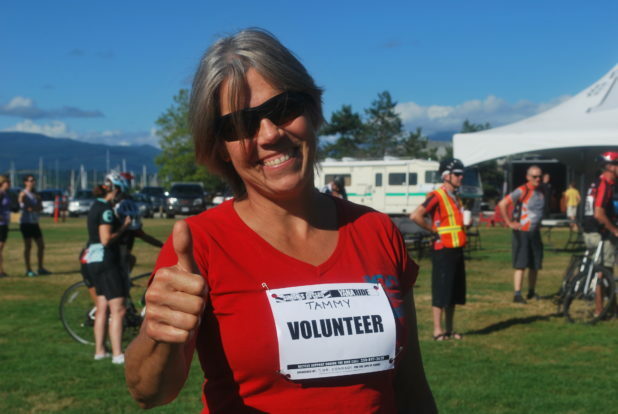 You Are Not Alone (YANA) — another Comox Valley entity — has a pool of 200-plus volunteers to contact when the time comes to host an event, such as the YANA Ride. It also has about 15 volunteers, including a board of directors, who assist on a regular basis. Community relations co-ordinator Ocean Varney describes them as an eclectic variety of youths, retirees, parents, empty nesters and millennials who are generous, lively, fun, and full of heart. A Stats Canada survey indicates 10 per cent of volunteers contribute over 50 per cent of volunteer hours. Most are 65 years or older. The survey also determined that youth are more frequently involved but on a shorter time period. A new angle of Volunteer BC is to engage the baby boomer demographic. “We need to find ways to engage them because they’re the ones that are going to have to take up the torch essentially,” Voigt said. “With this disparity in time contribution, there could be a bit of a problem there for non-profit organizations in the future if we don’t find ways to engage the baby boomer demographic. Voigt takes pleasure when explaining to clients that volunteers can pick and choose and dictate time commitment — unlike job seekers who take what they can get. Volunteer Comox Valley serves 300 to 400 clients a year. Many are newcomers to the community, or new retirees. Charities, service organizations and individuals looking for volunteers can advertise with VCV. This year, the organization received a $1,550 grant from the Comox Valley Community Foundation. The money will be used to purchase a digital projector to help train volunteer co-ordinators. “It’s going to be very helpful,” Voigt said.